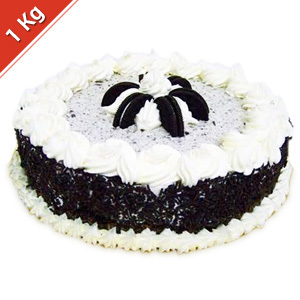 Send Krazy for chocolates Eggless Oreo Cheese Cake 1 kg to Chennai. Gifts to Chennai. Send Cakes to Chennai. Description : You can definitely delight your loved ones in Chennai with this unique and tasty eggless cheesecake which comes in round shape and also with yummy oreo biscuits. Bring smile on the face of your dear ones in Kolkata by sending him/her this delectable eggless oreo cheesecake offered by Krazy for Chocolates, a reputed Kolkata based bakery shop. With the trustworthy online gifting portal Gift2Chennai.com, you can easily send this cake as Gifts to Chennai. Product Specifications:Net Weight: 1KgFlavor: CheesePlease Note: Place order before 24 hours to get delivery on time. Picture is indicative. Actual might vary. Delivery in Kolkata only.